With the dangerous puncher Errol Spence Jr. challenging IBF welterweight champion Kell Brook this Saturday, Brook’s trainer Dominic Ingle is saying Kell would be interested in a rematch with Gennady “GGG” Golovkin, who he just lost to last September. It’s unclear if this is just a case of Ingle and Brook name dropping Golovkin’s name in order to get more attention and PPV buys on Sky Box Office for the Brook-Spence fight this Saturday night at Bramall Lane in Sheffield, England. Spence and his trainer Derrick James have given Brook grief about his habit of talking about his fight against Golovkin, and seemingly glorifying the loss. Brook had gone overboard in bragging about the Golovkin fight, and saying he’s created the blue print in how to fight him. Brook also said that he lifted Golovkin off the ground with a punch. It’s a bit much because that didn’t happen. Brook also thinks that the fight would have been different if he hadn’t been injured. Assuming that Ingle and Brook really want a second fight against GGG, this has to be the ultimate sign of courage by Ingle and Brook for them to want a second helping of GGG, because things didn’t work out too well last September even with Brook having the home country advantage and very generous scoring by the three judges that were assigned to the fight. Brook’s promoter Eddie Hearn would likely never put Brook in with Golovkin ever again. It would be too much of a risk at this point for Brook to fight GGG a second time. You can argue that the eye injury Brook sustained wasn’t just because of a freak punch from Golovkin. Brook got hit hard and his eye couldn’t take the power from Golovkin. Something had to give, and it was Brook’s right eye socket, which was fractured from a left hand from Triple G.
Hearn is talking about wanting to make a fight between Brook and Amir Khan in December. That’s what Hearn is saying. There are rumors that Hearn will be announcing a big fight for Brook inside the ring after the Spence fight this Saturday. If that turns out to be the case, then it wouldn’t be surprising if Khan is the one that is announced. However, Hearn talks a lot. I don’t think he would be able to keep a secret long enough if Brook were fighting Khan in December or someone like Manny Pacquiao. Hearn would have likely long ago bragged about the news on his Twitter account or the main guy that interviews him all the time on IFL TV. Brook’s loss to Golovkin did create a blue print in how to beat him. 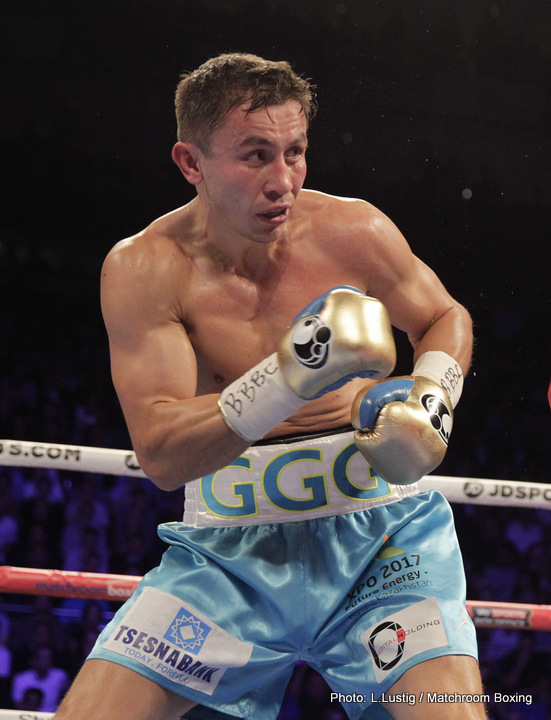 Golovkin showed that Brook can’t handle pressure well from a guy that doesn’t let him breathe. Brook tried to escape the pressure after exchanging punches with Golovkin in round 2. Brook didn’t seem to want any part of Golovkin after the 2nd round. The fight had become a rout at that point. Brook couldn’t stand and get his shots off because each time he would stop, Golovkin would pelt him with big power shots. Golovkin had an odd right hand that he was landing on the top of Brook’s head. The punch would come downwards on the top of Brook’s head. I don’t think Brook liked getting hit with that shot, because he stayed on the move in the final 3 rounds. Ingle did the only thing he could do in stopping the fight in the 5th. That was the best thing that Ingle did the entire fight He gave Brook pep talks, but the most important thing he did was save Brook from Golovkin in round 5 when the fight had gotten out of control. Spence doesn’t believe that Brook is on the slide with his career. I think it’s more of a case of Spence not all that impressed with what he’s seen of Brook in his past fights. Despite being a pro for a long time, Brook doesn’t have a lot of experience against good fighters. He definitely has a nice record, but the experience is just not there for Brook. He’s fought Golovkin and Shawn Porter. The rest of the fighters that Brook has fought were struggling guys that didn’t belong in the ring with him. Brook hasn’t been fighting world class competition. That’s something that Spence has noticed about Brook. He doesn’t have experience against the good fighters. Brook never fought Keith Thurman, Floyd Mayweather Jr., Marcos Maidana, Adrien Broner, Danny Garcia and Manny Pacquiao. It’s not Brook’s fault that he didn’t fight those guys. Those are not easy fighters to get a fight against. But never the less, Brook doesn’t have much experience against good opposition. “If I was Spence or his trainer, I’d be thinking ‘Kell Brook has so much courage and aggression’, that is what I’d be concerned about,” said Ingle.